Black and red National Flag of Flag of Albania. 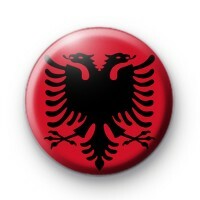 The Albanian flag is bright red with a silhouetted black double-headed eagle in the centre. Great for sporting events, schools and of course the upcoming Football World Cup. All our badges are 25mm and handmade in Cornwall.